Discussion in 'Member's Aquarium and Fish Pictures' started by Alyssasunshine9, Nov 12, 2018. Here is a picture of my whole tank, and some close ups of my peacock eel named Pocky and my senegal (dinosaur) bichir named Chimara! What are the cichlids in there? That’s true, it seems like a lot because when I got the eel I added sand in the right corner for him to burrow so he doesn’t hurt himself on the gravel and I just pushed it over to the rest of the tank which really built the gravel level up. Maybe when I do a water change tomorrow I’ll remove some so they have more space- good suggestion! I only have two cichlids and they are the big boys in the photo. 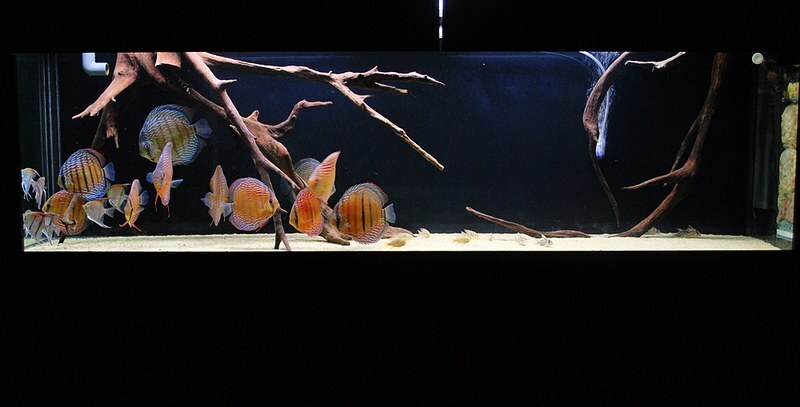 They are blood parrot cichlids, 6 years old! I use to have a plastic container with sand in and that sat inside the aquarium for eels and catfish. Then I had gravel around it. The container stopped the sand being spread everywhere and mixing with the gravel, but still gave the eels and Cories somewhere to play. Interesting idea, why did you stop? That’s a good idea! I was going to try and make a plastic partition to stop it from mixing but I ended up just putting it in because I wanted my eel to feel at home ASAP. It had been completely fine for a few weeks, no mixing, until my blood parrots decided to dig a hole and spray gravel into the sand/ sand into the gravel ¯\_(ツ)_/¯ I was able to mostly clean it up and they found a new spot to dig on the opposite side. Update on my floating plants- have had no luck with finding anything recommended by you all. The closest thing I found was azolla, a floating water fern. I only added a few pieces to make sure that my fish wouldn’t eat them and it wouldn’t cause any harm and it’s been fine so far! My eel likes them and goes to the surface and moves all the little floating pieces with his nose and out them all to one corner. He’s really inquisitive!! Lost all the fish and don't keep them anymore. Azolla aka mosquito fern is fine its basically a nutrient sink, It will grow fast if it has nutrients, don't let it cover the entire surface, keep it to about 1/3 of the surface area. When it gets a bit much scoop off a heap and put in the garden or pot plants, its a great fertilizer too.